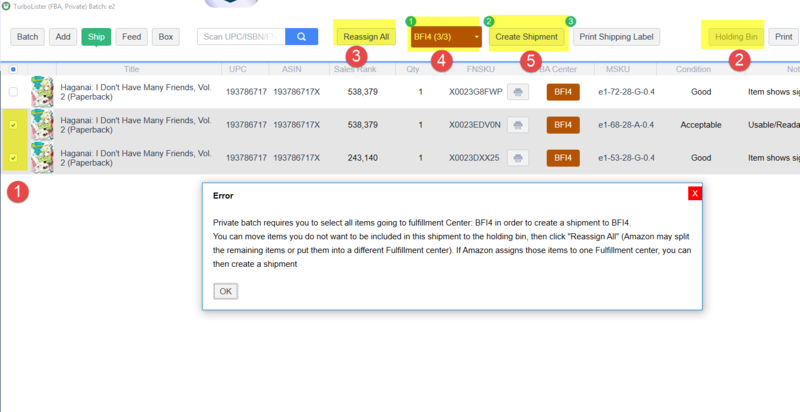 Live batch gives you the flexibility to use one box method (stop adding items when the box to a fulfillment center is full) to create a shipment, and skip box content requirement. But live batch can spread your items to multiple fulfillment centers unless you sign up Amazon Inventory Placement service. A private batch usually will spread your items to no more than 3 fulfillment centers, so you can save on shipping. But it is very hard for you to stop at one box because you do not know how many actual items will go to one fulfillment center. Here is a trick that may help you to achieve one box method even in private batch. It does not guarantee to work every time, but should work well on most of the time. Please follow the steps below. In private batch, select the items that do not fit into the current box. Click Holding Bin to move those items into holding bin. Click “Reassign All” on remaining items. Amazon will reassign those items to its fulfillment centers. If you are lucky, they will be assigned to one fulfillment center. Select the new fulfillment center.